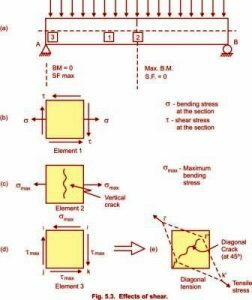 Learn : Effects of Shear Diagonal Tension, maximum bending tensile stress, tensile stress (σ) as well as shear stress (τ),crack pattern for a simply supported beam, The maximum bending moment in this beam will be at midspan and the maximum shear force, at the supports. Consider a beam AB subjected to transvers loads as shown in Fig. 5.3(a). The maximum bending moment in this beam will be at midspan and the maximum shear force, at the supports. The beam is subjected to bending and shear stresses across the cross-section. Let us consider a small element (1) from the tensile zone of the beam. It is subjected to bending tensile stress (σ) as well as shear stress (τ) as shown in Fig. 5.3. (b). At the midspan, the bending moment is maximum and the shear force is zero. So the element 2 is subjected to maximum bending tensile stress only. This tensile stress tries to pull apart the section as shown in Fig. 5.3(c) and the crack developed is vertical. At the support, the bending moment is zero and the shear force is maximum. Thus the element 3 is subjected to maximum shear stress and no bending stresses as shown in Fig. 5.3 (d). 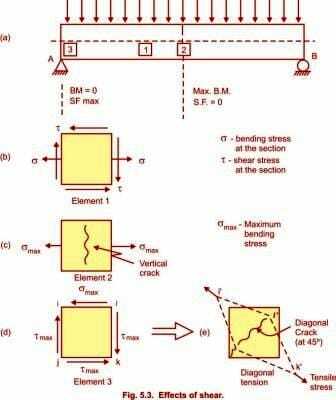 Due to this stress condition the diagonal ik of the element is subjected to tensile stresses as shown in Fig. 5.3 (e). As the concrete is very weak in tension it split along the diagonal (at 45º) and develops crack as shown. This tension which is caused in the tensile zone of the beam due to shear, at or near the supports is called as diagonal tension which is caused by shear, cannot be resisted by concrete alone. So shear reinforcement is provided in the R.C.C. beams to take up diagonal tension and prevent cracking of beam. The crack pattern for a simply supported beam is shown in Fig. 5.4. At or near the midspan, the crack will be vertical (flexure cracks due to bending alone). At or near the supports the cracks are inclined at 45º (shear or diagonal tension cracks). In between the supports and mid-span the cracks inclination vary from 45º to 90º gradually (flexure-shear cracks).